"A Modern Moral Fairy Tale" by Deena Larsen written in collaboration with MaJe Larsen, is a work of hypertext fiction deployed using 21st Century Modernist strategies. To best appreciate the rich tapestry they have woven together, it helps to understand it in the context of Deena Larsen's 20-plus year writing career. During this time, her poetics have developed through a serious exploration of hypertext technologies, literary structures, and interface design. At a glance, Deena Larsen's works are deceptively simple. She uses metaphorical graphical interfaces that make it easy for readers to understand how to traverse her work. But understanding the mechanism is only the beginning because the deeper a reader delves into one of her hypertexts, the clearer it becomes that the work's theme and signifying strategies are connected to the interface in subtle ways. Deena Larsen engages the form and structure of her works with the kind of attention characteristic of Modernist poets, and her work is best appreciated when read closely to allow these strategies to emerge. Marjorie Perloff has made a compelling case for how the project and "ethos" of Modernism continues in present times, despite being set back by two world wars and criticisms against specific practices and politics held by some of its major practitioners. Their politics left in past, the Modernist interest in formal innovation and creating "a linguistic field that has its own mode of being" become especially relevant in the digital age (Perloff). Hypertext in particular, lends itself to "exhibiting the alogical form Joseph Frank dubbed «spatial form,» its parts relating less by causality or sequence than by the metonymic structure of juxtapositions that came to be known as collage" (Perloff). As will become clear in this essay, Deena Larsen's structural methods are distinctively Modern, as is the way in which she expresses personal content indirectly through "myth and archetypal narratives," another strategy Perloff highlights. From its very title, "A Modern Moral Fairy Tale" is very much referencing older literary practices: fairy tales, moral (yet not didactic) narratives, and Modern (as in, relating to recent times, innovative, as well as in Modernist). The work references the media of its time — such as contemporary and older Web browsers, obsolete communication software, spam packages, and Web services, and social media — and does so overtly and through the design of selected pages, which reference different Web design periods. And apropos to its Digital Modernist ethos the work's overall aesthetic and computational design are deliberately and deceptively retro, as Jessica Pressman observes. The intentional rejection of fashionable trends and expectations serves as a strategy uniting contemporary digital writers. It also connects this movement to a longer tradition of similar rebellion, specifically, the modernist avant-garde (7). As will become clear in the rest of this essay, Deena Larsen is well versed in digital writing technologies, from HyperCard to Flash and the latest in responsive Web design. However, she chose to design "A Modern Moral Fairy Tale" in XHTML 1.0, a markup language from 2000 that described itself as "the next step in the future of the Internet" because with it "content developers can enter the XML world with all of its attendant benefits, while still remaining confident in their content's backward and future compatibility." This markup language, despite its bold claims, did not end up replacing HTML4 and the World Wide Web Consortium (W3C) chose to adopt HTML5 over XHTML 2.0 as its next Web standard in 2009. To consciously choose a discontinued markup language to produce a hypertext work that follows a largely text-driven link structure is certainly a Digital Modernist rejection of fashionable trends in computation and graphics-driven Web design. But in this, too, Larsen offers more than meets the eye. The XHTML may be over a decade old, but its CSS programming is perfectly responsive and will optimize the work to the reader's screen or browser window size. For Deena Larsen, building a metaphorical interface is integral to her writing process because she uses their structures to develop her works. This essay will briefly comment on a selection of works — many of which were previously written about in I ♥ E-Poetry (link to entries on Larsen's work) — along her career that show some of the hypertext structures she developed for her e-poems, much like Modernist poets created free verse structures that responded to their poetic goals. Written in HyperCard during the late 1980s and published by Eastgate Systems, Marble Springs (1993) is a series of interconnected narrative poems about the lives of women who lived in the 19th century in a mining town in Colorado. Published as a HyperCard stack in floppy disk, the work takes advantage of the software's capacity for creating complex link structures. There are so many nodes for readers to explore, that Larsen offers multiple interfaces, such as text links within each card, lists of characters, places, and connections, and a map (see figure 1). The reader is cast into a role akin to an archaeologist, digging around the texts to discover narrative threads, relationships, and hidden treasures. This early work's use of visual and textual links to structure the work graphically, narratively, and thematically prefigures "A Modern Moral Fairy Tale," which offers a more tightly woven yarn in comparison to Marble Springs's world-building scope. 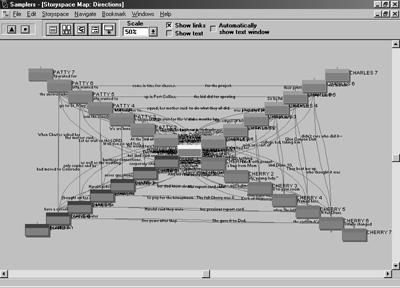 This kind of graphical interface also graces her second work published by Eastgate Systems, Samplers: Nine Vicious Little Hypertexts (1996). Authored and published using Storyspace, this work's cover reveals the metaphor that will lend structure to the collection: a sampler quilt (see figure 2). A sampler quilt is made up of many different design blocks. The sampler quilt is often used as a teaching tool for beginner quilters. Beginners can learn how to make specific quilt blocks and then make the finished blocks into a full quilt. The sample blocks can be related in some way, or can be completely different (Silvestri). Each story in this collection is its own little hypertext pattern, its own design block, and each design block offers her a writing constraint (see figure 3). The map of just one of Larsen's stories show how much attention she dedicates to developing the structure of her hypertext works. An as you might imagine, reading the stories in Samplers will lead you to discover links between the stories that stitch the blocks into a coherent narrative sampler quilt. This practice is evident in many of her works, and very clear in her Flash poem "Firefly" (2002). With its six 5-line stanzas that can be selected line by line, this combinatorial poem uses a similar structure to Raymond Queneau's "Cent mille milliards de poèmes" and Jim Andrews' "Stir Fry Texts." Larsen describes this as "a true hypertext in that it cannot be read linearly," yet she provides a mechanism to progress linearly through the stanzas and even provides a coda after reading the sixth stanza. Moreover, the background images change only when the "linear" reading link is selected, so even if one clicks on each line once to get to the original second stanza, that important contextual layer is lost. Reading the poem linearly does offer a lyrical narrative very much in the Romantic tradition, with a speaker going out into nature and having an aesthetic and philosophical experience. Combining the lines from different stanzas opens up some of the structure of the piece and leads to other insights beyond the linear narrative, so I recommend a hypertextual reading to supplement a linear reading of this musically charged piece. The practice of offering a default, alternative, and combinatorial reading paths in her works is implemented tactically in "A Modern Moral Fairy Tale." 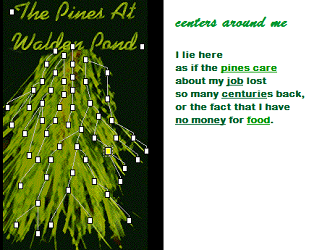 An earlier nature-based work (a common theme for Larsen) "The Pines at Walden Pond" (2000) is arranged on an image of a pine branch, in which several nodes are connected by spindly linear trails (see figure 5). Each trail of links can be interpreted as a line of thought, starting with four nodes that focus on the pines, the speaker's perception of them, Thoreau, and the speaker herself. Following the link trails lead to nodes that hold together well, though there are both physical and conceptual branchings. Clicking on links as they appear within each text also creates thematic associations. Both ways of navigating this poem lead to a powerfully associative coherence in a piece that engages the beauty of the place while questioning some of Thoreau's politics. While this is a simpler structure than found in "A Modern Moral Fairy Tale," it is representative of how her works offer branching lines of thought that hold together well, a key way in which Larsen's work can be thought of as Modernist rather than Postmodernist, which would use such structures to create dissociation rather than coherence. To head towards a conclusion, I will discuss one more work which offers an appropriate metaphor for Larsen's methods: "Carving in Possibilities" (2001). 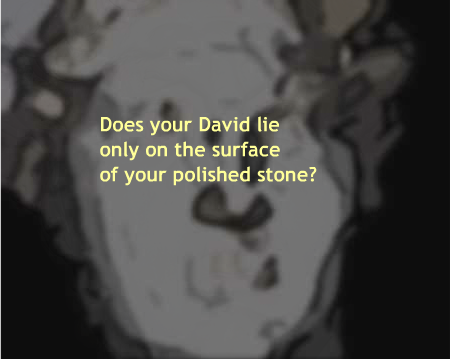 In this short piece, Larsen displays a blurred image of the face of Michelangelo's David (see figure 6) and overlays it with invisible hotspots triggered by the pointer, displaying color-coded texts from different speakers, making a sharp "carving" sound, and sharpening the focus of the image gradually over the course of 40 triggers. This approach allows readers to "carve out" different textual combinations and readings of the poem — a fitting example of Larsen's interest in metaphorical interfaces for her works. Through variations in color, size, and font indicate different voices and add weight to some of the lines. Focusing on the text and its location leads to insight on this work by Michelangelo, credited for saying, "Every block of stone has a statue inside it, and it is the task of the sculptor to discover it." Deena Larsen has been carving e-literature out of the possibilities digital media has offered her for over two decades now. See her sculptures and the tools she's used to shape them in her website, and note how what Perloff calls the ethos of Modernism, recast by Pressman as Digital Modernism, pervades her oeuvre. Larsen has truly engaged "the media of [her] time" to shape her prose and verse. Her use of authoring software, markup and scripting languages, and the rhetoric of the link mirror the Modernist engagement of the page as a space for visual composition (via the typewriter), exploration of free verse and new stanza structures, and intertextuality. And as you read "A Modern Moral Fairy Tale," keep in mind that what you have before you is approachable and understandable at a superficial level, but that the deeper you cut into the work with your own reading, the more you read closely its nodes, reading paths, and interfaces, the more it will reward you with its poetic and literary riches. This is Larsen's most mature work to date, building upon interfaces she explored earlier in her career to create a complex crystalline structure for her poem to shine through. Flores, Leonardo. I ♥ E-Poetry. 2012, 2013. Accessed 12/14/14. Larsen, Deena. Marble Springs. Watertown, MA: Eastgate Systems. 1993. Larsen, Deena. 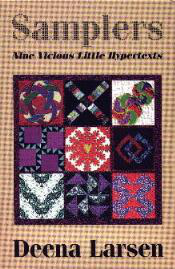 Samplers: Nine vicious little hypertexts. Eastgate Systems, 1996. Larsen, Deena. "Firefly" Poems that GO. Winter 2002, Number 12. Larsen, Deena. "Carving in Possibilities." Frame 6. trAce, 2001. Republished in The Electronic Literature Collection, Volume 1. 2006. Larsen, Deena. "The Pines at Walden Pond" Cauldron & Net. Volume 3. Spring 2001. Larsen, Deena. "Disappearing Rain" Deenalarsen.net. 2000. Perloff, Marjorie. "Epilogue: Modernism Now." A Companion to Modernist Literature and Culture (2006): 571-578. Silvestri, Karen. "How to Plan a Learning Sampler Quilt." eHow. 12/17/2013. Accessed 11/19/2014. Web. W3C. "XHTML 1.0 The Extensible HyperText Markup Language: A Reformulation of HTML 4 in XML 1.0." 2nd Edition. August 2002. Accessed: 11/19/2014. Web. Because this obsolete software no longer runs on contemporary computers, I will describe the interfaces through the Marble Springs 3.0 version, published using Wikidot in 2012 and based on extensive documentation of her unpublished 2.0 version (also in HyperCard). For more details on obsolescence and reinvention, read my 4-part series on Marble Springs in I ♥ E-Poetry. Leonardo Flores is Full Professor of English at the University of Puerto Rico: Mayagüez Campus and the Vice President of the Electronic Literature Organization. He was the 2012-2013 Fulbright Scholar in Digital Culture at the University of Bergen in Norway. His research areas are electronic literature and its preservation via criticism, documentation, and digital archives. He is the creator and publisher of a scholarly blogging project titled I ♥ E-Poetry (http://iloveepoetry.com) and coeditor of the Electronic Literature Collection, Volume 3. For more information on his current work, visit http://leonardoflores.net.